Announced on 2 December, the newly discovered comet Lovejoy is on a near-collision course with the Sun and is expected to plunge to its fiery fate late on 15 December. At its closest approach, it will pass just 140 000 km above the solar surface. At that distance, the icy comet is not expected to survive the Sun's fierce heat. Indeed, comets are such tenuous collections of ice and rocks that it could disintegrate at any moment. If the comet does stay the course, we will not see its demise because its closest approach will take place on the far side of the Sun. 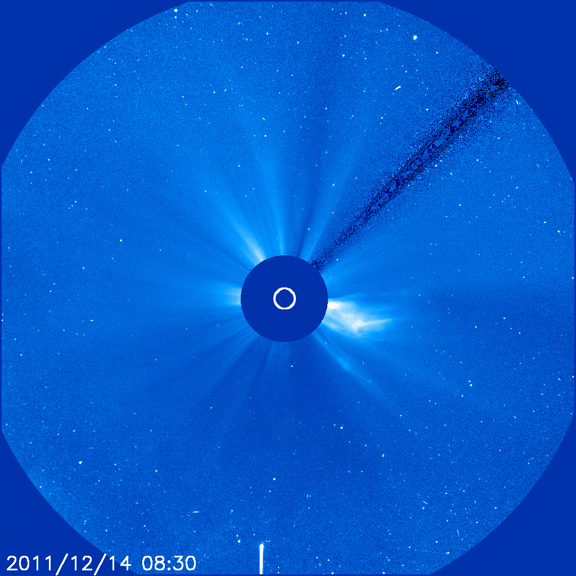 The ESA-NASA SOHO spacecraft is an exceptional discoverer of comets, spotting 2110 since its launch in 1995. However, comet C/2011 W3 was discovered from the ground by the Australian astronomer Terry Lovejoy, hence it is now carries his name. Terry was an early pioneer of using SOHO data over the Internet to discover comets. He can now claim to be the first person to discover a Sun-grazer from both ground and space telescopes. Comet Lovejoy is from the 'Kreutz group' - believed to be a fragment of a previous comet that broke up centuries ago. Other fragments of that great comet have become some of the brightest in history: comet Ikeya-Seki became so bright in 1965 that it was visible even in the daytime sky. Unfortunately, comet Lovejoy is not expected to become as bright as Ikeya-Seki. "On average, new Kreutz-group comets are discovered every few days by SOHO, but from the ground they are much rarer to see or discover," says Karl Battams, Naval Research Laboratory, who curates the Sun-grazing comets webpage.